When the former telecom secretary Rakesh Garg at an event, held in January in New Delhi, mentioned that roughly 4,000 gram panchayats (GP) were connected via optical fibre cable (OFC) under its national optical fibre network (NOFN) programme it did not surprise anybody. In fact, according to the December 2015 data shared by the telecommunications department, the cable had barely reached 37,000 GPs. 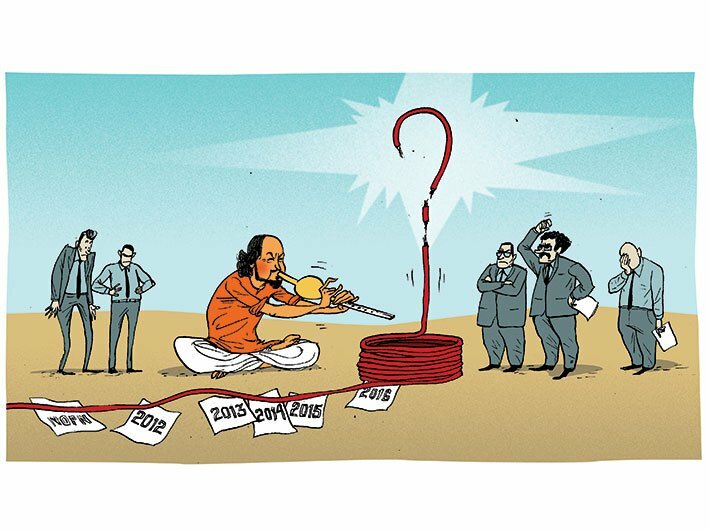 However, the low number did cast aspersions about the approach of the government in meeting its NOFN – renamed as BharatNet in early 2015 by the Narendra Modi government – intending to provide broadband connectivity to 2,50,000 GPs. One of the reasons for the delay, bureaucrats in the communications and IT ministry say, was the lack of participation from the private sector in bringing their services through the fibre network. So what has kept private sector away from participating in the project that was supposed to be set up with the Universal Service Obligation Fund (USOF)? Detractors say it’s the government’s policy or lack of it that is keeping the private sector away from BharatNet. “Environment for us to come forward doesn’t exist at this point of time,” says Rajat Mukerji, chief corporate affairs officer, Idea Cellular. “Currently, there is no process by which we can be involved in NOFN. The government had indicated right from the beginning that the project has to be rolled out by BSNL, so there is no question of private players’ involvement in it,” he adds. While he was candid and open about the issue, majority of the telecom players, including Airtel, Vodafone and Uninor, as well as major internet service providers refused to comment on the matter. An official from Bharat Broadband Network Limited (BBNL), implementing agency of BharatNet, agrees that the government has never involved private players directly for a dialogue. He also mentions that the government is now thinking of inviting them to take up connection from GPs to the homes of villagers. “It is likely that the government will take the bandwidth from BSNL and distribute it among interested ISPs through its own process,” the official says, adding that the foremost target of BBNL is to lay OFC in one lakh GPs by 2016 end and remaining by 2017. In the meanwhile, the telecommunications department (aka DoT) is on the “verge of finalising the policy for BharatNet” that will re-look into role of private players, a department spokesperson says. The new policy will also unveil a guideline for the states that have decided to execute the project through joint venture, a spokesperson from the DoT says. According the spokesperson, overall 16 states have so far shown interest regarding the same. The big question, however, still remains about the role of the private sector players and how the government plans to engage them. The common notion held is that in order to have industry’s support, there has to be some incentive for them; it’s a simple common sense that no private sector will put in investments in anything that doesn’t guarantees reasonable returns to their respective stakeholders. ComFirst India director Mahesh Uppal sums up the reason when he says that the key reason for the failure of NOFN is the government’s inability to align its incentives with those of the private sector. “The industry has a lot of expertise, especially management expertise as well as resources, which could have been used in designing and planning for national implementation of OFC,” he says. Brining fibre to gram panchayats is one thing and using the pipes to connect individual households to the nodes at the GPs is entirely a different story. It is an essential step that cannot be abandoned once the rollout of OFC has been completed. “There is no clear policy regarding how connectivity will be carried from the NOFN backhaul to homes, businesses, schools and colleges, hospitals, etc. The assumption of current policy is that there is demand for internet, and local entrepreneurs and ISPs will grab the opportunity to build viable retail models. However, the fact of the matter and the demand on the ground is quite different,” says Amrita Choudhary, director, Cyber Café Association of India (CCAOI), which is a non-profit organisation working towards internet penetration to masses. Adds Osama Manzar, founder, digital empowerment foundation: “Local participation is one way of achieving last mile connectivity. To do this the government needs to open up distribution channel of broadband via OFC by giving licence to local service providers.” According to him, this approach can reduce the government and BBNL’s dependency on big telecom operators for providing connection and reaping true benefits of the NOFN programme. “The government should adopt the bottom up distribution channel approach. What this means is that it should create a policy framework that allows NGOs and other organisations to become local service providers who will be familiar with the demands of their areas. Under a panchayat there won’t be more than 1,000 houses. So how do you expect a private company to get into that panchayat?” he quips. Similarly, organisations like AirJaldi Networks, a rural broadband connectivity provider, are also in talks with the government for utilising the NOFN infrastructure to provide connection in various parts of India. It’s like community radio stations, if someone is interested in only 500 villages, they should get license to do so for that level, and be charged accordingly, Manzar states, adding that this approach of providing last mile connectivity through local players would also encourage entrepreneurship. “Let there be infrastructure, local service providers and stable connectivity, villagers will themselves adopt the technology and will become digitally empowered,” he concludes.